Cyclists hit by turning trucks is a repeating news story which highlights the most serious deficiency in our system — education of cyclists. Sometimes these crashes are caused by the truck driver passing a cyclist prior to turning right, but they are also caused by the cyclist passing the truck on the right. In both cases, the cyclist has the power to avoid the crash. If a truck passes you, slow down and let it get ahead of you ASAP. If you are approaching an intersection, merge to the left and ride near the center line to avoid the moving blind spot. See CRASH! Avoiding the Dreaded Left-Cross. Or, just don’t pass a truck on the right at all. And be cautious when passing on the left, too. Trucks make wide turns. They cannot physically make a right turn from the right curb, so they will often leave a large, inviting opening on their right prior to a turn. They will also move straight into the intersection before starting to turn. When a truck turns right across your path, it is almost impossible to escape its rear wheels. So don’t get caught in a spot where this can happen! Be aware of what kind of situation can lead to a potential crash and avoid it. Don’t miss CyclingSavvy co-founder Keri Caffrey’s July 2018 post on this topic. 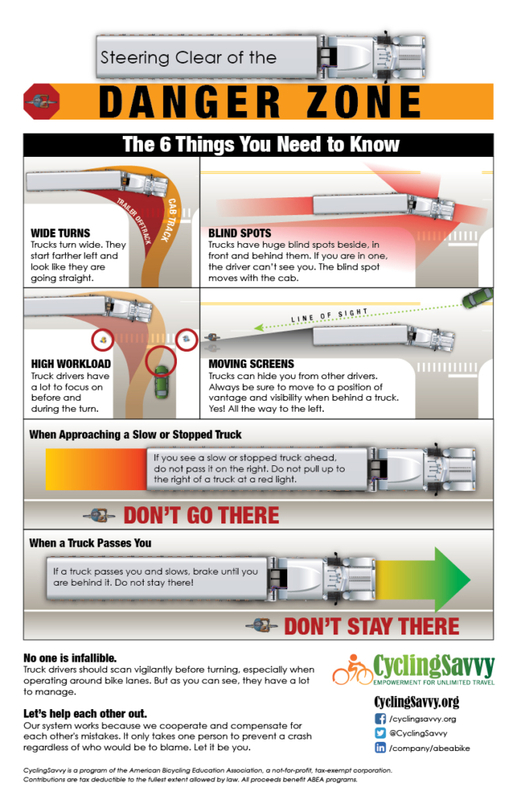 Explore the interactive graphic below to learn more about trucks. Save a Life. Spread the Word. Share this page, or the video above. Or download and print the poster below. Hang it wherever you think cyclists might see it! One piece of information can save someone’s life at a critical time and place. Save a life. Share this page.